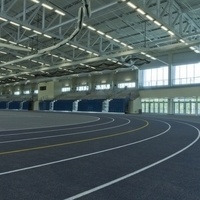 Located inside of the Athletics & Events Center, Glazer Arena is home to special events and is a competition venue for the Ithaca College men's and women's indoor track & field and men's and women's tennis teams. It has hosted wrestling events as well. Admission events and convocation have taken place inside of the arena.